Photograph collection of A Healey. Chester station, the morning of May 9th 1972, the end of the road for Class 24 No.5028. The twelve year six month career of D5028 saw allocations to Eastern Region and London Midland Region depots. Noted 1964 with Athermos axleboxes (both bogies). Time between last Classified repair and withdrawal: 44 months. March 1961 to Willesden (1A) on loan, made permanent May 1961. January 1966 to Bletchley (1E). June 4th 1972 - withdrawn. After withdrawal the remains of 5028 were stored at Chester until August 14th 1972 when it was forwarded to Crewe Works on August 14th 1972 and broken up there by the end of August 1972. Movement: 5028 Chester - Crewe Works August 14th 1972 by Class 47 No.1856. Noted Derby Works April, May & August 1962. Noted Derby Works August 1963. Noted Derby Works January, March & August 1965. 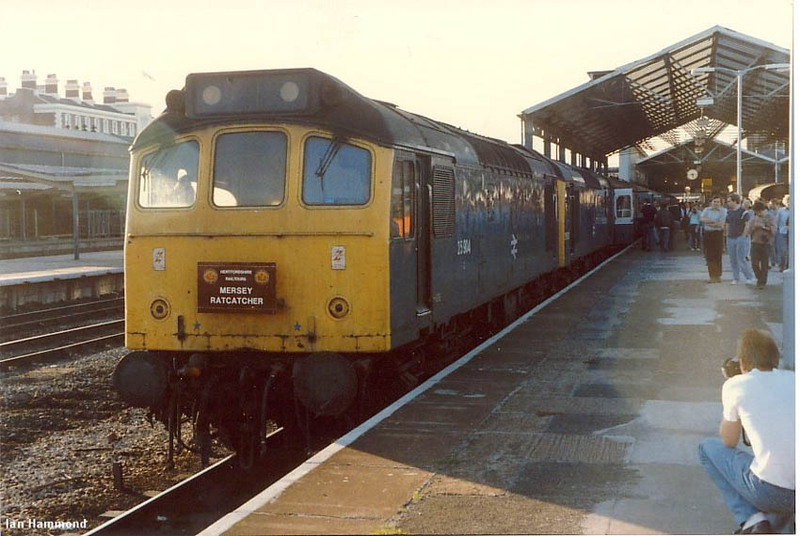 D5028 was delivered to Ipswich (32B) during mid-November. Condition no month: green livery with small yellow warning panel with curved upper corners, bottom of panel partially covers frame level stripe, gangway doors present, full size fuel and water tanks, no blanking plates, hand/footholds present, ridge sided sandboxes, two-rung bogie mounted footsteps, Athermos axleboxes fitted. With the WCML electrification progressing northwards the new home for the majority of the LMR Class 24s would be the Stoke Division. A great many were re-allocated there during 1967 including D5028 during August. Photograph courtesy Tony Sayer. D5028 undergoing repair at Derby Works on August 31st 1968. This would be its last major repair, including much repanelling in the vicinity of the radiators, its green paint would be replaced by the familiar blue & yellow. This was the occasion of the annual Horticultural Show and Works Open Day. Photograph courtesy Grahame Wareham After its visit to Derby Works in 1969 5028 was outshopped in blue livery with two BR emblems and two numbers on each side. 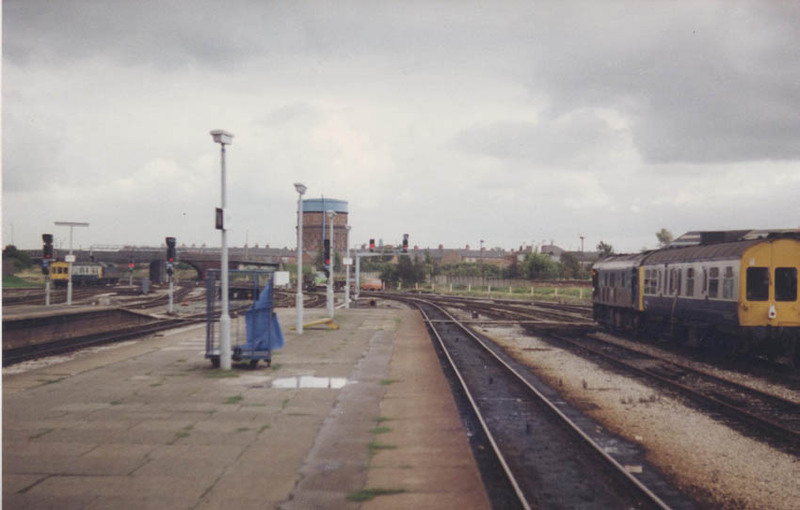 It is seen here at Crewe during August 1969. Condition August: blue/yellow livery, two numbers on each bodyside, BR emblem on each cabside, gangway doors present, full size fuel tank with circular gauge, shortened fuel tank, no blanking plates, hand/footholds present, straight sided sandboxes, three-rung bogie mounted footsteps. Thirteen years of anonymity and obscurity came to an end for 5028 on the evening of May 8th 1972 when it ran away on the approach to Chester station and caused considerable damage to itself, several diesel multiple units and much of the station fabric around Platforms 10 & 11. 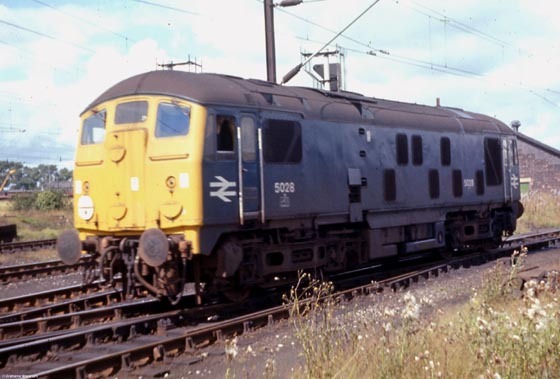 5028 had been in charge of the 8D66 19.31 Ellesmere Port to Mold Junction freight consisting of thirty eight vehicles including several tank wagons loaded with petroleum products. The train had been made up at Ellesmere Port East Yard with a total weight of 980 tons. For this train on the route to Helsby the total weight limit permissible for a Class 24 was 1,150 tons. Beyond the reversal at Helsby the train required a fitted head to allow operation to Mold Jct, this was achieved by the five vacuum brake fitted tank wagons which would be next to the locomotive after the reversal at Helsby, providing a brake force of 134 tons. 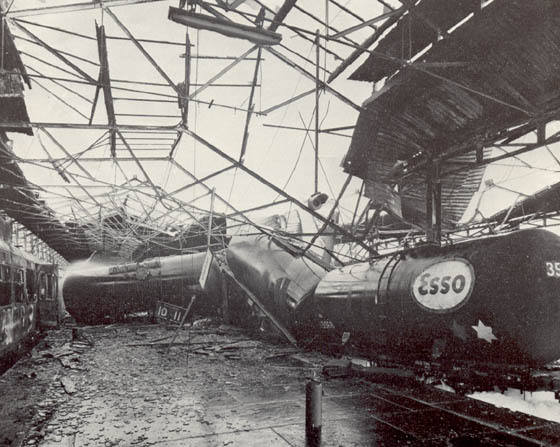 At Helsby the sequence of events was set in motion when the reversal took place but the vacuum hoses were not connected between the locomotive and the tank wagons. For reasons undetermined both the driver and guard were aware that a fitted head was required beyond Helsby to safely control this train, but the train set off without this being established and without a brake test being carried out. About a mile and a half from Chester station the grade on the line from Mickle Trafford falls at 1 in 100 for about a mile, it was on this grade that control of the train was lost, with the driver sounding a series of short blasts on the locomotive horn, indicating the train was running away. Unfortunately the means of putting the runaway train on to one of the through lines was prevented by the movement of a diesel multiple unit betweens Platform's 11 & 13. With the freight train routed into the bay Platform 11 events happened swiftly, the driver and a second railman jumped from the locomotive as it entered the platform at about 20mph. Standing at the end of the platform were empty diesel multiple units 56229 & 50946. The trailer composite (56229) lost both bogies with major damage to the underfloor equipment occurring when it was pushed over the buffer stops onto the platform and coming to rest embedded in the wall of the refreshment room. The motor brake second (50946) was completely demolished as 5028 rode up over it. The brake van next to the locomotive was severely damaged, four of the tank wagons sustained damage from the collision, particularly to the running gear. Despite the severity of the collision none of the loaded tanks were punctured. 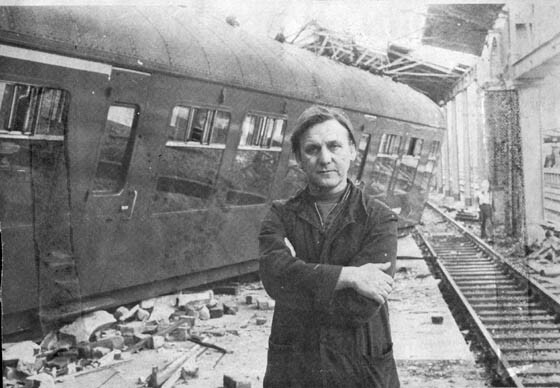 Shortly after the collision fire broke out under the remains of the diesel multiple unit crushed by 5028. A locomotive waiting at the east end of the station was used to haul back thirty five wagons of the freight train, the split being made between the third & fourth tank wagon. Passengers from the diesel multiple unit standing at Platform 10 were quickly evacuated to the running lines in the centre of the station. A postal worker was trapped on the platform between the diesel multiple unit and an overturned BRUTE trolley loaded with mail bags. Rescue attempts were unsuccesful until the front two coaches of the diesel multiple unit were separated from the other three, creating room to free the postal worker. Although the three Esso tanks remained unpunctured the fire was intense enough to heat the contents of the second tank, pressurising the liquid which then ignited after being released through the pressure relief valve. The first tank, lying on its side lost some of its contents through the syphon pipe, and was ignited from the original fire source. The third tank suffered no spillage or leakage due to the efforts of the fire service, using foam and water to contain the fire. The fire was contained just prior to midnight and finally extinguished about thirty minutes later, although the tanks remained in a dangerous condition for a further nine hours. For 5028 the examination next morning revealed it to be a total loss. The leading cab was severely crushed, the trailing cab had lost most of its aluminium structure in the fire, which also destroyed (melted?) the radiators and buckled the engineroom floor. The brake gear had been badly damaged in the collision though it did not reveal signs of heavy braking. A 'C' examination had been carried out at Crewe on April 26th, the brakes were reported as 'weak' on May 4th but were found to be in good order when examined as part of an 'A' exam on the same date. No other reports were recorded to the date of the accident. 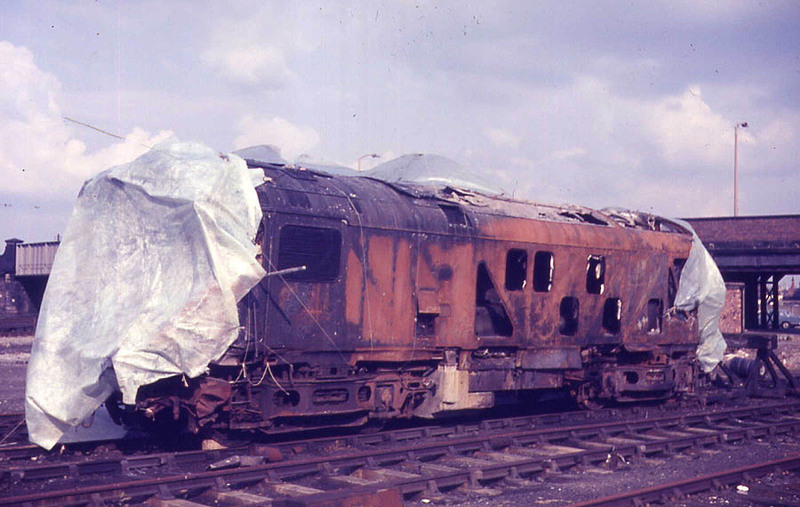 The No.2 end of 5028 shows the damage sustained in hitting the diesel multiple unit, parts of which are visible in the photograph. 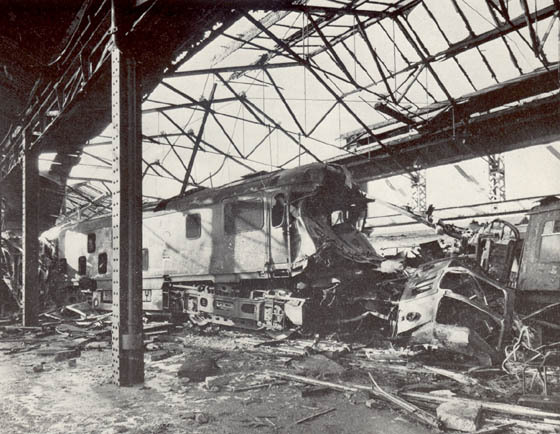 The fire started under the far end of the locomotive, destroying much of the fabric of the No. 1 end cab and the radiators behind the bulkhead. The three tank wagons which the Fire Service fought hard to keep cool are seen here, the nearest one still shows the bed of foam laid down underneath them to keep them as cool as possible. The burned remains of railcar 51195, which formed part of the five car 19.15 Bangor - Crewe, is visible on the left. Six diesel multiple unit vehicles were written off in this accident (50407/946, 51195, 56154/229/338) - all were removed to Cashmore's Great Bridge yard and broken up by December 1972. Both the above views are taken from the official accident report. The text has gone missing which accompanied this newspaper cutting but presumes it comes from the Royal Mail's newspaper and features one of the postal workers involved in the events of May 8th, with much of the devastation still apparent. 5028 was withdrawn during June, on August 14th 1972 the remains of 5028 were removed to Crewe Works by Class 47 No.1856. 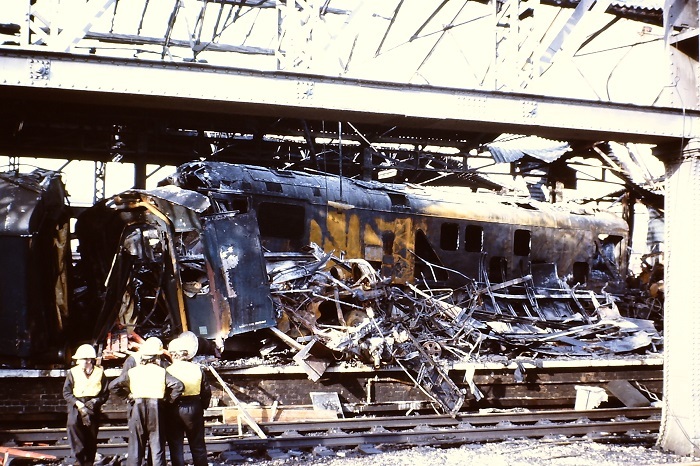 The locomotive was broken up by early September 1972. Photograph courtesy Steve Jordan. The unfortunate 5028 has been extracted from the station and now awaits removal to Crewe Works, fit for only one thing. Repair limitations on the Type 2s were reached if both cabs and sub-floor needed replacement - 5028 requires a little more than that. It is perhaps remarkable that this locomotive was allowed to make that last journey to Crewe. Photograph courtesy P.O'Garra. 25060 stands on the center roads at the east end of Chester station on a gloomy September day in 1984. The photographer is standing on Platform 10 which on the day of 5028's runaway was occupied by the 19.15 Bangor to Crewe multiple unit. The runaway train ran into Platform 11, seen here to the left of the photographer colliding with an empty two car diesel multiple unit. At the time of the runaway Chester No.2 signalbox would have been dominant center left in this photograph. Photograph courtesy Ian Hammond. Looking the other way now, 25904 & 25910 occupy the platform used by the Bangor - Crewe service, to the right is where 5028 ran into the bay platform occupied by M56229 & M50496, both written of as was a considerable portion of the station roof, additionally M56229 demolished 35 feet of the refreshment room wall and bringing down part of the ceiling. Page added September 13th 2016. Last updated September 3rd 2018.